Having clean, clear windows in your office building is more important than you’d think. Not only does it give the building a greater curb appeal, it has the potential to improve positivity in the workplace. 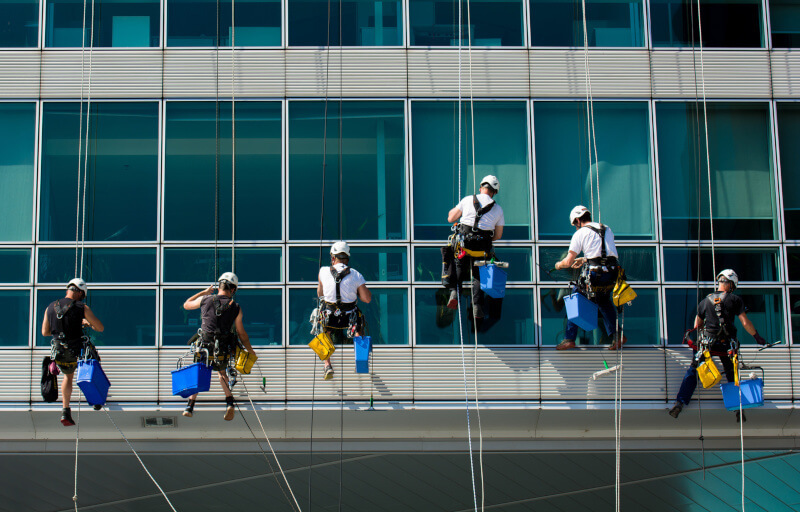 Here are the most frequently asked questions about window cleaning services. The impression you give your customers counts, an, that often starts before they ever set foot inside your place of business. We know how important it is for your business to look clean, professional, and welcoming and having clean windows is an easy way to do this affordably. Having clean windows also promotes health and tidiness among your employees who will appreciate having a clean working environment. 1. Whose Windows Do You Clean? We specialize in commercial window cleaning for small to medium-sized office buildings up to 3 floors. Our clients appreciate that we can offer a full office cleaning from carpets to bathrooms to windows and everything in between. 2. How Often Should I Have My Windows Cleaned? For most of our commercial clients, we come by on a weekly basis to clean the outside of the windows as well as the ledges and doors. A once a month cleaning of the windows inside is recommended. If you own a restaurant, we suggest getting both sides of your windows cleaned every week since greasy fingerprints from young guests are common. 3. How Can I Prepare For The Window Cleaning? No special preparation is required for us to clean your windows. We have all of our own equipment and supplies. Just makes sure to leave a clear path to the windows by removing any furniture or breakable items first. You can continue running your business as usual and we’ll let you know when we’re finished. 4. Can You Fix The Foggy Moisture Between The Panes? If moisture has accumulated between your sealed, double-pane windows, there’s, unfortunately, nothing we can do to remove it. You would either have to have your windows replaced or call a specialty company that can remove the moisture between the panes. 5. How Will The Weather Affect Your Window Cleaning Services? We offer window cleaning services to our clients year round, so temperature is not an issue. If you have an overhang covering the front of your door, a light rain shouldn’t affect our ability to clean the windows. However, high winds, heavy rain, and thunderstorms might require a reschedule. For pressure washing appointments, we require that the temperature is above freezing. 6. Do You Only Clean The Window Panes? In addition to cleaning the inside and outside of your window panes, our window cleaning services include hard water removal and cleansing of your window sills, window frames, and window tracks. We have tried and true methods for cleaning hard water spots and can get your windows looking brand new again. Save yourself the trouble of hiring a separate janitor, floor cleaner, and window cleaning service, and turn to BearCom Building Services for all your commercial cleaning needs. Check out our satisfaction guarantee and read more about the many cleaning services we offer.